[01:02:48 CEST] <michaelni> did the files use similar bitrate ? [01:03:31 CEST] <durandal_1707> i could try to target it but why? [01:12:10 CEST] <iive> atomnuker: may I request one more test run, all_float and presearch_rounding, at the same time. [01:12:37 CEST] <iive> you gave me a single number yesterday, it's bug i've made. [01:15:40 CEST] <atomnuker> so ALL_FLOAT_PRESEARCH cpuflag(sse42) && 1 and PRESEARCH_ROUNDING 01? [01:22:26 CEST] <iive> atomnuker: one more thing. [01:22:48 CEST] <iive> aka, no code. [01:22:55 CEST] <iive> once is enough. [01:23:04 CEST] <atomnuker> wouldn't it be more useful to run them with an empty function? 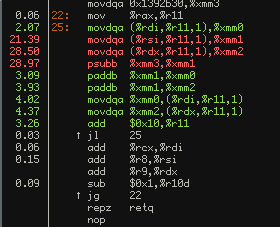 [01:25:12 CEST] <iive> stop timer has an instruction fence, and it takes a lot of cycles to finish all codes at it. [01:25:54 CEST] <iive> nice. similar to my cpu. [01:39:29 CEST] <durandal_1707> i wasnt thinking ..
[02:02:58 CEST] <jamrial> ubitux: can you test the coff patch on the ml with your freedos box? [03:14:02 CEST] <graphitemaster> right now I'm consuming it at the rate it suggests, which is fine, but our application has a global time scale, doing things this way leads to aliased or clipped audio naturally. [03:17:34 CEST] <Compn> which api are you using graphitemaster ? [03:22:47 CEST] <graphitemaster> problem is I need to control the filter while decoding a stream, it needs to be immediate, I can't just open a stream with a filter, I need to control time scale pretty much at runtime at any time. [10:42:20 CEST] <thebombzen> Ah. Why not ffv1? isn't that now a standard? [12:15:57 CEST] <durandal_1707> whats funny? [12:44:55 CEST] <thebombzen> is this something that would get added to libavfilter? [12:51:46 CEST] <durandal_1707> thebombzen: basically you need report max and min value of pixel in video frame? [12:52:02 CEST] <durandal_1707> for example for y component? [12:58:15 CEST] <durandal_1707> thebombzen: doesnt cololevels already does that via negative number set for imin and imax? [12:58:35 CEST] <thebombzen> I don't know, does it? [13:47:32 CEST] <Compn> where ? [13:47:38 CEST] <durandal_1707> kierank: what? [14:57:27 CEST] <TMM> am I supposed to do something? [15:01:26 CEST] <BBB> did you send a new/updated patch? [15:02:06 CEST] <BBB> how long ago? [15:48:59 CEST] <wm4> "    This fixes build failures on older mingw chains (before 2012)." [15:52:05 CEST] <iive> wm4: sure, but you have to fix them if somebody finds they cause regression. [15:52:44 CEST] <TMM> durandal_1707, Did you add those extra checks? [15:52:49 CEST] <TMM> durandal_1707, to interplayvideo? [15:53:32 CEST] <TMM> durandal_1707, isn't that the exact same check that's on like 1292? [15:56:30 CEST] <TMM> bytestream2_init doesn't actually read anything though, right? [16:05:36 CEST] <durandal_1707> there is more stuff? [16:29:18 CEST] <wm4> is that ok? [16:30:09 CEST] <wm4> because configure is a labyrinth and I don't need an additional wall to enable idiots (people on ancient mingws)? [16:49:12 CEST] <wm4> nevcairiel: want to test my d3d libav merge before I push it? [16:49:46 CEST] <wm4> I could probably steal a dxva header from somewhere for that to test compilation at least? [16:49:56 CEST] <iive> wm4: is that check somehow makes merges harder? [16:52:17 CEST] <iive> is mingw now a distribution? [16:55:05 CEST] <nevcairiel> wm4: do you have a branch for testing? [17:04:08 CEST] <wm4> is just "ffmpeg" the right way to refer to CLI? [17:07:11 CEST] <wm4> due to the messy way to making the code "generic"
[17:08:23 CEST] <nevcairiel> configure missing something? [17:08:34 CEST] <nevcairiel> or allcodecs.c or whereever? [17:17:35 CEST] <nevcairiel> so is hwaccel supposed to crop now? [17:19:50 CEST] <durandal_1707> my asm code made function 5x times faster but original utvideo decoder is still faster, how so? [17:20:35 CEST] <atomnuker> by how much? [17:26:22 CEST] <wm4> nevcairiel: still testing my branch? [17:29:04 CEST] <nevcairiel> maybe for random reasons d3d11va is off for you? [17:39:01 CEST] <nevcairiel> does d3d11va output to yuv420p for some reason or is it just not used? [17:42:15 CEST] <nevcairiel> do all the get_format calls need the new d3d11 pix_fmt? [17:47:44 CEST] <wm4> pushed to my branch, want to take another look or should I push to the ffmpeg main repo? [18:31:50 CEST] <durandal_1707> dos attack again? [18:34:45 CEST] <durandal_1707> so anyone have perf setup already? [18:35:37 CEST] <ubitux> durandal_1707: what do you need? [18:37:20 CEST] <ubitux> can you provide command/sample? [18:37:45 CEST] <ubitux> what resolution? [18:54:11 CEST] <jamrial> ubitux: speaking of speed, do you know why the aarch64 stereo interpolate functions are so slow? [19:10:02 CEST] <paras_2052> durandal_1707: hi, by metadata you mean the header of the fits image, right ? and i have to export it using the metadata AVDictionary in the AVFrame ? [19:25:33 CEST] <durandal_1707> atomnuker: have you looked at writing alternative bit reader? [19:27:32 CEST] <atomnuker> you create the drama by calling it drama in the first place and then you complain about there being drama! [19:54:48 CEST] <JEEB> which for local usage is "enough"
[20:05:03 CEST] <J_Darnley> Okay. I've got an big question regarding avcodec. [20:05:48 CEST] <J_Darnley> Does it already have the ability to encode a slice (part of a frame) without the whole frame being available? [20:09:25 CEST] <J_Darnley> That might be slightly easier than trying to extend avcodec like that. [20:11:31 CEST] <J_Darnley> kierank: well as far as I can tell because sliced threading exists what you want already exists. [20:11:38 CEST] <durandal_1707> kierank: are you gonna use rust-av? [20:20:53 CEST] <kierank> atomnuker: decoder is easier, right? [20:20:53 CEST] <tmatth> kierank: did you ever stream vc-2 over RTP or other? [20:21:20 CEST] <tmatth> kierank: nice, in upipe or some other repo? [20:24:29 CEST] <kierank> atomnuker: are you sure not doing valid decoding slice by slice will be easier? [21:00:11 CEST] <gh0st__> Does anyone have a machine with a cpu that has avx-512 instruction set to test avx-512 assembly code on it? [21:08:15 CEST] <BtbN> Isn't that pretty much limited to Xeon Phi right now? [22:09:28 CEST] <Compn> can we up the max_channels limit ? [22:09:44 CEST] <Compn> michaelni ? [22:27:48 CEST] <Compn> "Invalid sample rate or channel count!"